Influencers can be powerful brand allies, but these collaborations require an entirely new approach to marketing, according to Carat Global Chief Strategy Officer Sanjay Nazerali. A version of this perspective previously appeared in Huffington Post and Advertising Week 360. Working in strategy at one of the world's largest media agencies, I’ve witnessed countless pitches about influencer marketing and the growing power of creators. But increasingly, these YouTube influencers are also becoming attractive partners for deeper collaborations. What’s it actually doing for my brand? Should I do an endorsement or product placement? These have always been tough questions to answer. Even though almost everyone has been jumping on the influencer marketing bandwagon, few understand what “influence” really is or how it works. Until now. Together with YouTube and Nielsen, my team analyzed the results of hundreds of brand and creator videos in the U.S. and the U.K. to understand the impact of influencers for brands. 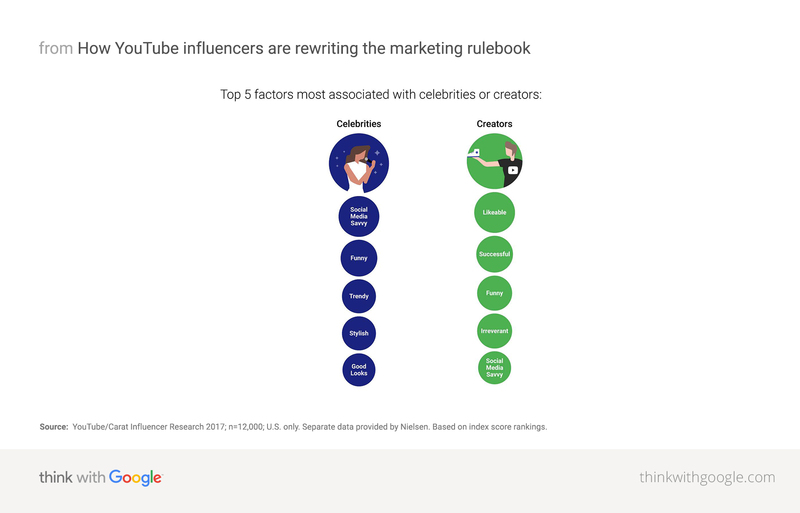 YouTube influencers, however vast their reach, are absolutely not “today’s celebrities,” and celebrity marketing and influencer marketing offer fundamentally different benefits for brands. For instance, we found that celebrities are more effective at driving recall than creators (84% versus 73%).1 Given that a celebrity’s job is to be famous and memorable, that makes sense. Source: Nielsen/Carat/YouTube Branded Video Study, May 2017. But what’s interesting about our findings is just how far YouTube influencers stretch beyond the beauty category. In some categories, such as snacks and alcohol, they can have even more impact, driving significantly higher than average purchase intent.5 So the idea that influencer marketing is purely for young people who are looking at fashion and beauty brands simply isn’t true. Our research found that deep thematic integrations with creators drive the highest results for brands.6 These are more involved integrations where the influencer plays a role in creating a piece of content—such as a demo—with the brand. They’re far deeper than product placements and they work more effectively. Of course, deep collaborations can be more than some are ready for. For certain objectives and categories, the easiest and most effective way for brands to tap into the power of influencers will be simply to run their own ads on YouTube creator content. We often assume that the right YouTube influencer is either an aspirational version of our target audience or that they’re just like celebrities. Neither of these assumptions is correct, and it’s perhaps here that celebrity and influencer marketing differ the most. Influencer marketing is more than a bandwagon. It’s a powerful, scaled form of communication. Humor is also interesting, because it reflects a sense of community. YouTube helps forge a special relationship between followers and influencers, one that reflects a sense of co-ownership. This familiarity creates a degree of intimacy that makes the use of humor seem much more natural than it would with celebrities. This is probably also why we see celebrities such as Dwayne Johnson increase their influencer scores when they get really active on YouTube. Source: YouTube/Carat Influencer Research 2017; n=12,000; U.S. only. Separate data provided by Nielsen. Based on index score rankings. If I take one thing from this study, it’s this: there's a huge cultural shift in the nature of celebrity, authenticity, and community—all topics we as marketers care about. And this shift is being driven by a new class of diverse, authentic voices we call creators. While this new form of marketing can be powerful, it requires a different approach. If we don’t play by the right rules, we won’t harness its full potential. If brands want to make the most of these new marketing opportunities, they need to get strategic and granular. For those willing to invest, it’s clear that influencer marketing is more than a bandwagon. It’s a powerful, scaled form of communication. Now, we finally have the beginnings of a strategic approach to it. 1-7,9 Nielsen/Carat/YouTube Branded Video Study, May 2017. 8 Data2Decisions, “The TV Stack Effect,” Global, 2017.